While it’s hard to rope off open areas like parking lots, sidewalks and the facades of buildings as “No Smoking” zones, unsightly cigarette butts and the stench of smoke lingering long after the smokers themselves are gone does no favors to your workplace or home. 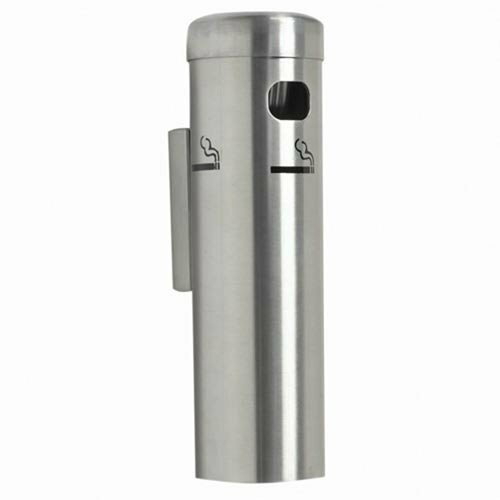 Cigarette receptacles are the key, especially when it comes to public places where people tend to pass frequently on their smoke breaks. Their compact, vertically capitalizing structures save space, while their capacity and construction give you a place to chuck away cigarette butts and snuff out the smoke, along with the likelihood of leaving behind a smoldering fire hazard. Check out our picks for the best cigarette receptacles for the job. A compact container 30 inches high and 11 inches in diameter, this receptacle comes in 5 unassuming colors that would fit in at any patio, walkway or car park. The flame retardant construct of the item is designed to limit oxygen entry into the receptacle, putting out still-burning cigarettes faster and reducing the risk of a fire, while used butts and ashes gather in a removable, galvanized and flame-resistant bucket with plenty of capacity to collect debris all day to be conveniently disposed of later. The receptacle is a two-piece item with an easily detachable lid for quick access, sealing off the contents when closed to keep rain out. The sturdy polyethylene design also makes it a hardy, resilient item which won’t rust, chip or crumble over use, especially when exposed to the elements outside. While the receptacle is quite sturdy on its own, you could also opt to use a little sand to weigh it down if you’re planning to set it up in places prone to heavy wind and rainfall. 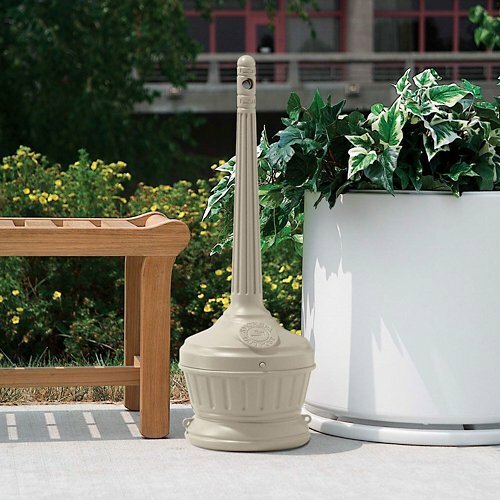 Both ADA and FM compliant, this receptacle meets all the standards for quality and technical performance you’re looking for in an outdoor item intended for community use. A practical but tasteful-looking item, this 30-inch tall receptacle will fit in easily beside a park bench or the deck chairs of your patio. 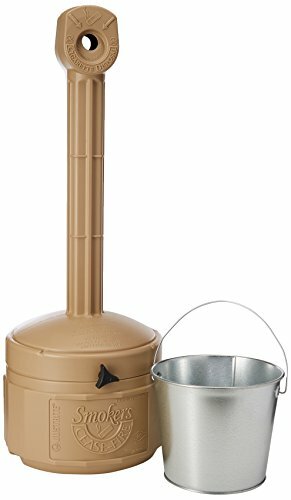 The heavy-plastic receptacle seals all the debris inside with a fastening knob that helps secure the top and bottom of the outpost together when in use – to dispose of the debris, you simply unscrew the top and remove the galvanized pail situated within the base, designed to collect used cigarette butts and ash. The air-tight locking mechanism ensures even lit cigarette butts will extinguish on the way down the smokestack, with little to no space for water or rain to get inside either. Durable on its own or with a little sand deposited into the pail to weigh it down if it gets too windy, this budget receptacle promises you value for money, simplistic to use and easy to maintain, be it outside your office building or in the yard for an outdoor gathering or barbecue. You don’t need to worry about weighing down this wall-mounted receptacle – the sleek aluminum construction of this item makes it perfectly sturdy, non-flammable, water-proof and rust and damage-resistant, with three types of finishes available to choose from to flatter the ambience of your location of choice. It comes with a wall bracket to keep it attached discreetly to your balcony or veranda wall, or outside a restaurant or café, from which the receptacle can be detached to empty via the removable cap. Highly durable and weather-resistant, the opening of the receptacle is narrow enough to put out any smoking cigarettes, as well as holding an in-built snuffer, to do away with the risk of the rest of the butts catching fire and billowing out smoke. The galvanized steel of this receptacle’s can ensures that it is completely fireproof, the bright yellow making it difficult to miss by anyone having a smoke outside. The plastic top and smokestack are secured in place with two screws. The closed-off structure of the receptacle also ensures cigarettes will go out once dropped inside, without risking starting a fire. The can, where your discarded cigarette butts gather, can be weighed down with a little sand to let it withstand heavier winds in colder or breezier months. With an 11-inch diameter, 35-inch height and 2.5-gallon capacity, it takes up little space, but effectively keeps your yard, office-front or parking lot clear of smoking cigarette remnants. This receptacle also comes with an FM approval, as an endorsement for its technical integrity and quality. A simple but effective way of cutting down on litter anywhere smokers gather is to introduce an accessible means to dispose of cigarettes – and when it comes to outdoor locations, the answer is usually a good cigarette receptacle. Look out for options between heights 30 and 35 inches – these are just right to situate beside outdoor benches or near seating areas, tall enough to reach without effort even if you are standing up as well as accessible to those with disabilities and using wheelchairs or other aids. Make sure your chosen receptacle is also properly galvanized – this means the collection system is fire-proof, eliminating the risk of the receptacle or its contents catching fire. The most convenient receptacles come with a removeable pail or bucket where cigarette butts and other debris would collect, easy to take out and clear in between high-volume smoker traffic. Receptacles should also come with means to completely seal them off against outside elements, keeping water from dripping in as well as keeping oxygen out – this ensures that lit cigarette butts will extinguish from the lack of fuel to burn and there won’t be any risk of the rest of the debris catching fire.